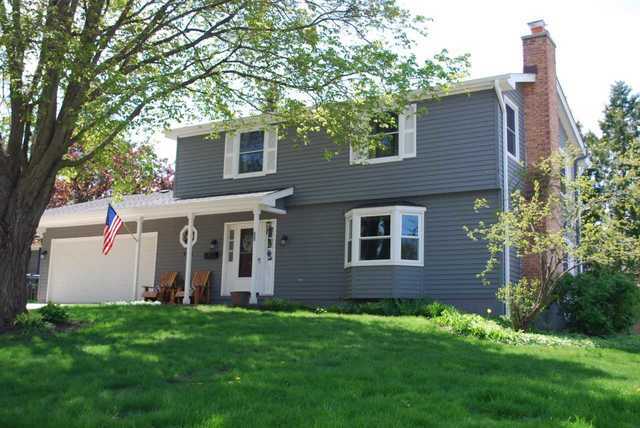 Lovely 4 bedroom home on quiet cul-de-sac in Barrington Village. Walk to schools, train and town. Updated kitchen with granite, gas cook top, new SS appliances including double oven and French door refrigerator. Kitchen contains breakfast bar, eat-in area, built-in buffet and desk. Living room with wood burning fireplace and built in shelves. Master bedroom with walk-in closet and en-suite bath with marble multi-jet shower and double sinks. Newly refinished hardwood floors on main level and all bedrooms. Finished basement with wet bar and ample storage closets. Enjoy the fenced backyard with large deck, paver patio, fire pit and storage shed. New roof, windows, washer/dryer and water heater. Award winning district 220 schools. Listed by Robert Picciariello of Prello Realty, Inc.